Did you know the color brown is associated with humility? Did you know VanGogh drank himself to death? Actually, there are a number of theories on what drove him over the edge. 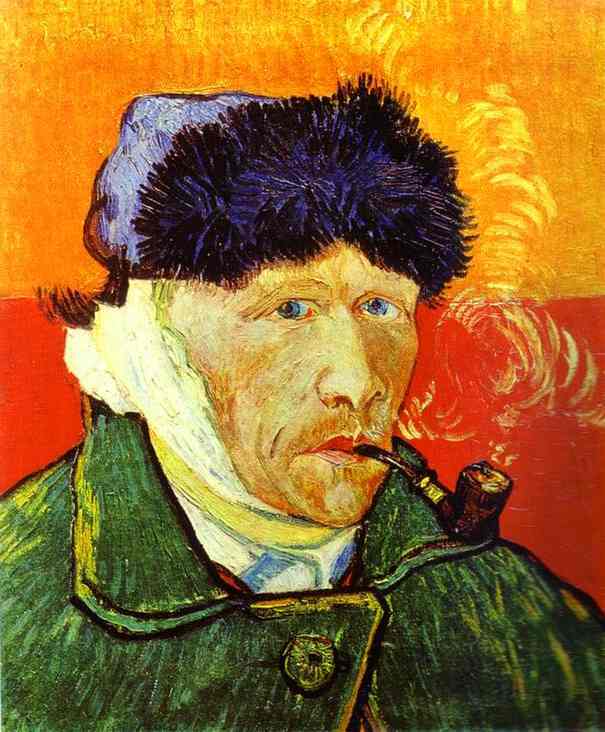 And by "edge", I'm talking about a serious drop-off into the deep end--I mean, who cuts off his own ear and then paints a picture of himself all bandaged up? But did you know he was also a preacher for a time? And maybe the lack of care for the poor around him, for whom he was so compassionate, is what drove him mad. Or maybe it was the paint he wouldn't stop eating. And color theory is what we talked about today. VanGogh was a color genius. T oday I avoided telling children that VanGogh was a drunken kook, and we focused on the product of his pain--beautiful paintings. And for us today: art inspires art. ...and even a triadic harmony. I may have gone a little deeper into the fascinating topic of color theory than I intended for my young audience--but, hey, it's really interesting stuff! And I think they got it. It showed up in their work, anyway. I love it when they leave saying to each other, "That was fun." And to me: "Thanks! Thanks for teaching us, it was fun." Thing is, they really mean it. This was fun to see your musings and then your student's work. Thanks for posting.